The Geek-a-long is a yearly mystery blanket KAL hosted on the Lattes and Llamas blog and Ravelry group. 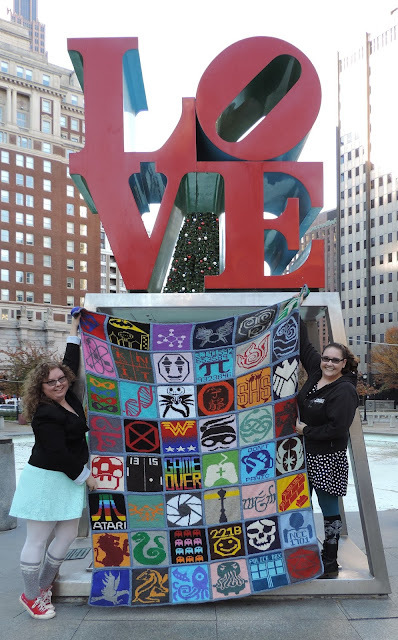 Each Sunday, a free pattern for a geek-themed double-knit or crochet square is released; Megan-Anne and Jac ask only that participants consider a donation to the Child's Play Charity. 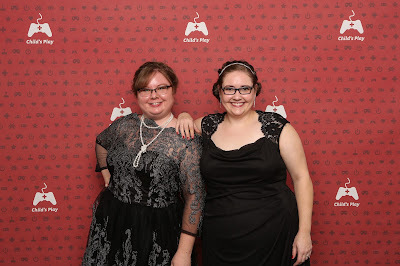 Once again, Knitter's Pride is proud to be a benefactor, and we want to share a little bit more about the Geek-a-long with our fans this month. Jac & Megan-Anne of the Lattes & Llamas blog. Each year, Megan-Anne and Jac design 48 different squares which are centered around a fandom theme (this year, it's Mad Scientists); from these 48 squares, participants can choose 24 squares to create a 48"x72" blanket, which means that it's not too late to join in to this year's event! After 48 weeks of releasing square patterns, information about how to assemble the blanket and add an edging is shared on the Lattes & Llamas blog. All past square designs can be found here on the Lattes & Llamas website. Last year, the Geek-a-long event raised $3,440 for the Child's Play Charity, which is a game industry charity dedicated to improving the lives of children with toys and games in their network of over 70 hospitals worldwide. They hope to surpass this goal in 2015, and we look forward to watching their progress over on the Lattes & Llamas blog. Megan-Anne shares a bit more about this KAL in the mini-interview below. Enjoy! What inspired you to start the annual Geek-A-Long event? I always wish that I had a really pretty story where Jac and I brainstormed for days over the perfect way to support our favorite charity. It’s the kind of story with a sepia filter and a montage in the middle with “Eye of the Tiger” playing. But the truth is, Jac had the idea for the GAL in the beginning of December, 2013 and it would be fair to say that my original involvement in it stemmed from a lost bet. I am ashamed to say I thought she was completely nuts. We were at Starbucks (so, basically a day ending in “y” around here), and she pitches me the idea to do a year-long KAL, AND to do it in double knitting (really cool, but takes twice as long), AND to release a color work chart for it each week, AND to cover as many nerdy fandoms as possible in the blanket, AND to have the first square come out on the first Sunday of 2014, and every Sunday there-after. I pointed out that was less than a month away, and told her just how insane I thought she was. She pumped me full of espresso shots until I thought it was a great idea, and we went home that night and sketched out about half a year’s worth of squares. I charted out 10 or so the next day and cast on. We had a huge stash of Cascade 220 sitting around, so we chose that for the blanket, and by a few months in Cascade generously stepped in as a sponsor and provided the yarn for the rest of the 2014 blanket as well as the 2015 blanket. The first year was rough because I had to do so many squares at once at the beginning of the year. We were slightly more prepared for year 2. And I can’t even begin to tell you how excited I am for year 3, it’s going to be amazeballs and it’s my favorite theme so far. Tell us more about the charity the Geek-A-Long supports. Here’s The Deal: Since 2003, we’ve set up and organized Child’s Play, a game industry charity dedicated to improving the lives of children with toys and games in our network of over 70 hospitals worldwide. Over the years, you as a community have answered the call and come together to raise millions of dollars. Child’s Play works in two ways. With the help of hospital staff, we set up gift wish lists full of video games, toys, books, and other fun stuff for kids. By clicking on a hospital location on our map, you can view that hospital’s wish list and send a gift. Child’s Play also receives cash donations throughout the year. With those cash donations, we purchase new consoles, peripherals, games, and more for hospitals and therapy facilities. These donations allow for children to enjoy age-appropriate entertainment, interact with their peers, friends, and family, and can provide vital distraction from an otherwise generally unpleasant experience. Congratulations to PaulaK, you have won a Rhine Needles & Crochet Hook Case! We will contact you to arrange for the delivery of your prize. Thanks to everyone who entered this month's giveaway! Jana Huck is a knitwear designer based in Luebeck, Germany; she is mostly known for her patchwork interpretations of the symmetry drawings by Dutch graphic artist M. C. Escher. Jana also designs garments and accessories and blogs in English and German at www.janukke.com. 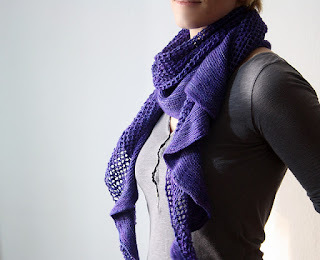 She has a group on Ravelry, janukke Strickdesign, where you can join KALs and other knitting related activities. Hop over and have a look, Jana loves to hear back from knitters! I have been knitting for almost seven years now. Once I had figured out how to follow directions and how the knitting process works, I wanted to realize my own ideas. And it didn´t take long until I wrote them down so that I could share them with other knitters, which is ridiculously easy ever since the invention of the internet and Ravelry. 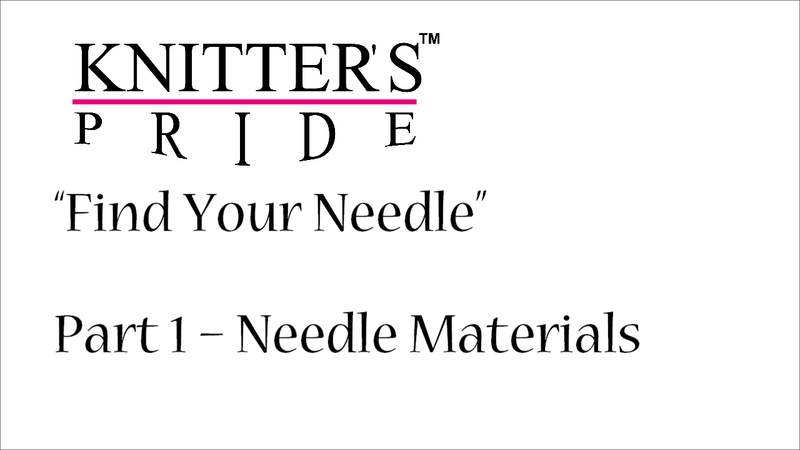 I cannot say enough how wonderful it is to get in touch with other knitters and share ideas, inspirations, techniques and so much more! I draw my inspirations from everywhere. From life really, as cheesy as this is. Everything around me is intense and often pretty. 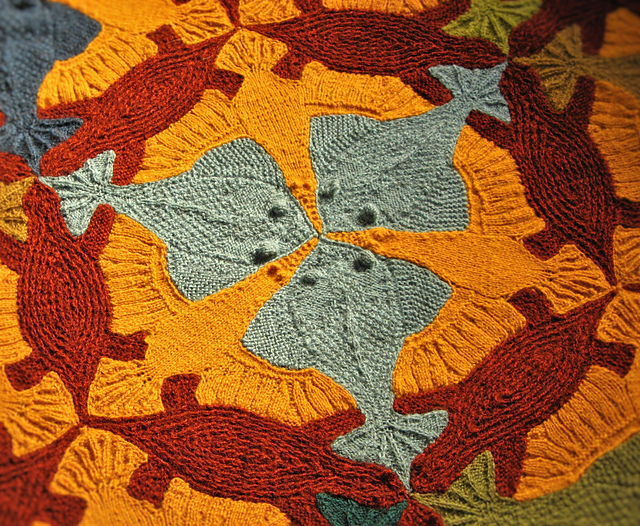 I especially like to be inspired by nature, but I have also often been intrigued by architecture, graphic patterns, the art of M. C. Escher, and the work of other knitters, among other things. Often the yarn itself is what makes me think of something. It can be anything, for example the way leaves are dancing in the wind on a tree in spring, something completely random like that. With that picture in mind I start knitting. My goal for every design is that it is new and has never been seen before like this. All inspirations are merely jumping off points and become a thing of their own. How did Janukke Strickdesign come about? 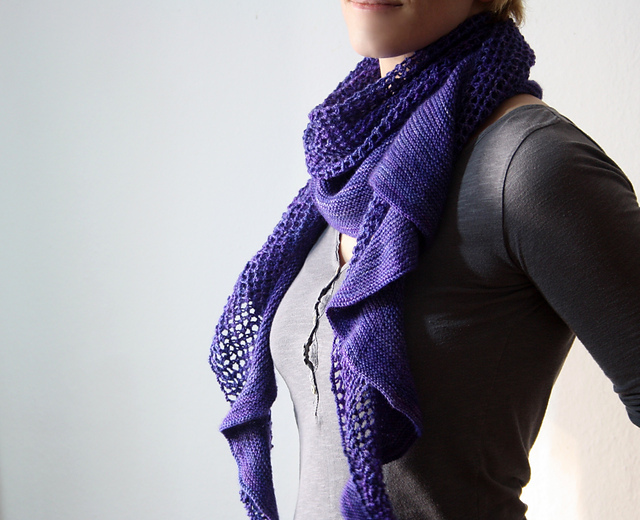 When I started designing I used the alias “janukke” on Ravelry. Later it became the label “Janukke Strickdesign”. How do you balance your own design and blogging career with curating Janukke Strick Design? Ah, you are asking the hard questions! … That´s something I come back to every so often to reevaluate. Naturally, I am drawn to designing. That´s what I started out doing and what I enjoy. But caring for the public and social media part of designing is how knitters get to know my designs, so it is very necessary. And I enjoy talking to knitters tremendously – it´s how many new friendships developed over the years. So it´s a balance. Sometimes I feel I am focusing too much on knitting, then again I have the notion that I am not knitting anymore at all. So I guess the average is ok.
Of course! Who hasn´t. But none of them are too entertaining. There´s the sweater that for some reason fell into my laundry unnoticed and got unintentionally felted, there are the beginner mishaps of choosing the wrong yarn (who knew merino would grow All That Much?) or the wrong pattern (eek, I look like I never heard of such thing as fashion). This year I have so many great plans that it´s hard to pick only one or two. I´ll be working together with yarn companies, meeting other knitters that I know through the internet, teaching workshops, … and I haven't even mentioned the many designs I cannot wait to get done and put out there. I already had my first small success this February with my new Sea Buckthorn shawl collection, which is a good start into 2015, I think. 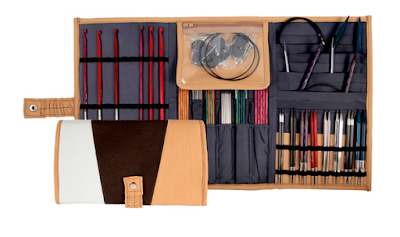 This month we're giving away a Rhine Needles & Crochet Hook Case to one lucky blog reader. To enter, leave a comment on this post sharing your favorite design from Jana Huck's Ravelry Page. Don't forget to leave us your Ravelry ID so we can contact you if you're our lucky winner!